Profoto Silver Softlight "Beauty Dish" Reflector for Profoto - 20.5"
The Profoto Softlight Reflector , a.k.a "Beauty Dish" gives a center-weighted beam. Its 20.5" diameter gives soft shadow definition. Its finish is efficient and highly specular. The center disc that blocks out the direct light can be replaced by an optional semi-opaque opal glass disc to create a center hot spot which also eliminates a donut-hole effect in specular highlights. The optional Softlight Grid accessory yields 10° coverage for more directed light. Box Dimensions (LxWxH) 21.7 x 21.0 x 7.5"
Silver Softlight "Beauty Dish" Reflector for Profoto - 20.5" is rated 4.8 out of 5 by 10. Rated 5 out of 5 by Caio from Smoking hot Finally had the chance to buy this beauty. It is as important as a camera to a professional photographer. A must have. Rated 5 out of 5 by Brad R. from Spectacular! Silver over White by a long shot! The first Profoto Softlight reflector I owned was the white version, and when I finally went to replace it after 9 Years of service I took a gamble and got the silver. My reasoning was that the silver could easily mimmick the white with a diffusion sock, but give me more power on location, and a more focused spotlight effect that could be achieved with the white version. The results were amazing, the subjects almost seem to glow with this modifier, and IMHO it adds dimension to the fram that the white couldn't quite acheive. Couldn't be happier, this thing is my new best friend. You really cant go wrong with profoto, for those of you using newer heads, make sure to buy the dome adaptor, you absolutely need it, the built in reflectors on the newer flash units aren't compatible with this modifier. But donl;t fret you'll only need one Dome Modifier for your keylight. Rated 4 out of 5 by Bill from Profoto Silver Beauty Dish Great light modifier as expected. Well built, but too expensive - the standard Profoto formula. If you can part with the cash, you won't be sorry. Two things of interest are (1) As between the silver dish or white dish, the silver produces harder / edgier light BUT with the addition of a diffusion sock, it calms that light into a much softer look. So, with the silver dish, one can bring out both hard and soft light. The white dish produces lovely soft light....but can't produce the harder, edgier look of the silver. Silver dish = better value. (2) I wasn't sure if I needed to purchase an extra Profoto speed ring in order to be able to affix the dish on to the B1 strobe. Turns out, you do not as the dish has the rubber mount on the back as part of the dish itself. Nice! Saves an additional $$expense. Gave four stars only because of the price. This dish is super nice, but for almost $400, I think Profoto takes advantage of those (me) who tolerate such expense because of our view that the B1 and/or B2 strobes are superior to other choices. Rated 5 out of 5 by Seth from Amazing light, tremendous detail! I absolutely LOVE this BD from Profoto. I took this on a shoot for an actress here in LA and for one set up this was the ONLY light used in a very tight, small location. It provided very punchy light with a smooth falloff. NOTE: This should be used on people with darker skin. If you are shooting people with pale skin then this may be too much and you have to switch to the White BD. Rated 5 out of 5 by EMP from Love it! Perfect key light for head and shoulders but works full body as well. The light is Soft but still punchy and specular. Its expensive i guess, but everything profoto is. And as an investment, you wont need to replace it as long as you take care of it. 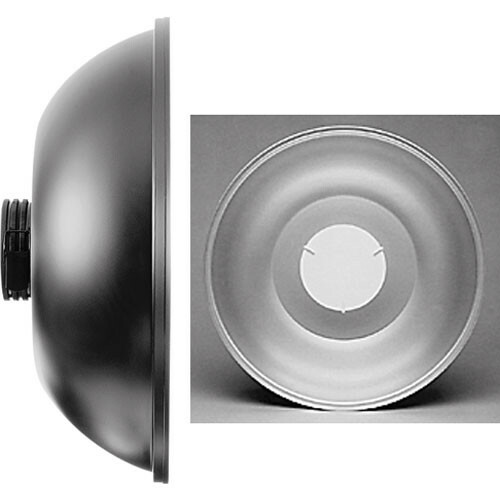 its not built as heavy duty as the Broncolor dish, if it gets dropped it will bend and dent easily so be careful. Rated 5 out of 5 by Eli Images from Amazing and a must have I was trained with a specular beauty dish and I needed my own so this piece of equipment met every requirement and really sets my work apart from others. Great piece!!! Rated 4 out of 5 by Sam from Crisp Great for an edgy look. Sharp and crisp light output. Definitely more of a portrait or fashion photo tool.